These prints were my first time trying a new (for me) ink. I had just about exhausted my supply of the Outlaw Black ink back in the spring, so I ordered a new can, but also decided to try the standard Gamblin brand of black relief ink. A little less expensive, and not nearly as stiff as Huck's special formula. Lacking a portable palette, I couldn't move to a more well lit room, so I worked in the half darkness of the Studio. This Portland Intense Black is much thinner than the Outlaw ink. 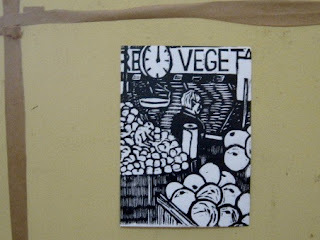 Spread easily with my ink knife, rolled up on the brayer easily, and the good proofs are fine. Some proofs are a bit smudged, but I think that has less to do with the ink and more to do with the difficulties of printing on small pieces of paper with no margins. I could see using this lesser ink for students and classes, but I'll probably go Outlaw for my own personal work. Below is a photo of one of the good proofs. So today I took the two good proofs, stamped them with my chop mark, numbered and signed them, and brought them, to Belmar. Left a few business cards as well, which will be packed in the bags with the prints when the time comes. It's been quite a while since I updated people as to what I've been up to with art. That's because I haven't been up to any art lately. Hoping to get back to the usual soon, but probably not for a few weeks. Where I left off in mid-June, I had the latest supermarket block in progress, and had just finished construction on the sink project. Glad I got the sink done when I did, as my free time is pretty much gone right now. Shortly after the last post, I was called by my community college and asked to teach a summer class. The last time I taught a summer college class was back in grad school, a different state and century from where we are sitting now. Actually, following my first semester at this community college I received a summer teaching contract in the mail, but when I contacted my chair (back in the old days college departments had chairpersons) he told me that a full timer had decided that she wanted the class, so he would have to offer it to her. (in typical fashion, no one signed up, so the class was cancelled anyway) This time the class was Art History II, one that had been assigned to Molly, but she decided she had something else she'd rather do. (not the first time this has happened) She had brought up the possibility a month before that she might need me to cover the class for a few days, but now it was suddenly a six week commitment. And the class would be starting in one week. I asked for copies of the text and previous syllabi so I could see if I could put it together. After a couple of days to evaluate everything, I agreed. A few reasons. First of all, the money would mostly make up for the spring 2D class I had cancelled. Second, though I have taught Art History I a few times at this school, they offer fewer sections of II, so it was a opportunity to get this one on my resume. Third, though I have never taught this particular class at this school, I am very familiar with the art from using it in my studio classes there, so the material was familiar. So I jumped in. The class meets four mornings per week, two hours per day. It's listed as Gothic to Modernism, but the assigned text starts with early Renaissance, and Modernism is covered in Art History III at this school. As it is, there is a whole lot to cover in 20 class meetings. I expect to get to the beginnings of Modernism, but not all of it. As I said, I know the material, but I still have to write lectures, create tests and other assignments, plus figure out how to organize it for the time I have. I'm used to using slides for this purpose, but last time I taught art history (about 6 years ago) it was a fall and spring and also had classes at my university, so I could pull slides from their extensive library. I'm not driving 100 miles a day just to get slides, so that's out. An interesting option I was given was a new device called a document camera. A few years ago this school installed a computer system in all the classrooms. This camera is essentially an opaque projector, plug it into the system and it will project anything put on it onto the large screen in the classroom. Thus the textbook has become my slide library, supplemented with my own library. So far the class is going fine. Grades have varied, but everyone is still showing up. Two weeks left, and they still need to take one more test and do a research assignment, but I think it will work out. But between the class itself, the commuting, and moving things around campus, this had taken a lot of my time. And this is not my only job. I have replaced last year's non-teaching job at the deli with a new non-teaching job in a group home, which has been 2 to 3 days per week, between hours in the house and lots of required training I have to attend. Which is why no new art has happened for almost two months. That changed today. The Belmar Arts council is doing a fundraiser/exhibition soon called Art on a Line, where artists are donating small works on paper, which will be hung on something like clotheslines, and people can buy them for a low price. Well, works on paper is what I do. No time to start a new project, but I do have lots of old blocks, and got a new shipment of ink a while back. And today was my one day off in the midst of all these jobs, so late morning I went up to the Studio, bringing a handful of 5x7 pieces of heavy paper I was given for this purpose. I decided I would try printing sections of supermarket prints, just black and white. I selected a few blocks, got out the supplies and tools, took a break to get some lunch, then went back downstairs to crank out some quick prints. Just as I was about to start, the lights went out. This past month we have had a series of heat waves, and today began what may be the worst one of the year- mid to upper 90's every day, high humidity, for four or five days. The power company couldn't quite handle it, so we had a brown out- outlets keep working (fan, music), but overhead lights were out in my space, the hallway, and random spaces in the building. 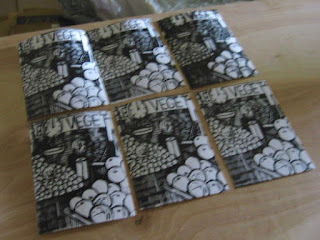 Thanks to bright sun and our windows, I could see just enough to do some basic woodcut printing, I pulled six copies of the same portion of one block, cleaned up, then got on to my next stop of the day. The poor quality of the photo is at least partly due to the lack of light in the Studio. Maybe two of these proofs are of quality enough for this show, and I'll photograph one of those before I turn them in. So the prints are drying and I'll be going back to creating lectures from my textbooks for next few days.